FLASH!!! 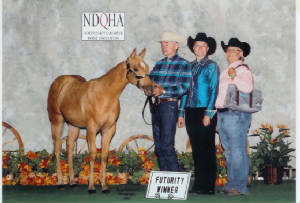 - 1st day of NDQHA futurity show - double judged - class winner - under both judges (weanling geldings futurity) - also shown in Amateur Geldings 2 & under - 2nd place under both judges receiving two reserves in grand & reserve amateur geldings. 2nd day of NDQHA futurity show - double judged - class winner again (weanling geldings futurity) - also shown in novice amateur 2 & under geldings - 2 class wins!!!!! Going back in Amateur Geldings 2 & Under - Class WINS under both judges, and receiving another reserve in amateur gelding grand & reserve. Not bad for a weanling! Watch for updates on this good gelding! 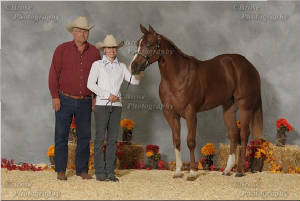 Weanling Geldings - October 8, 2011 - Won the amateur 2 & Under - Getting another Reserve!!!!!! Congrats! Sold Congraulations to Gary & Kathy Hersom, Jesup, IA on the purchase of this pheonominal gelding. Huge win for this colt - 9/18/11! 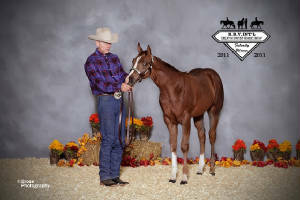 Congrats to Don Patterson, Grand Forks, ND on this special colt. Continued Success!